This soup is easy to make, and there is not much you can do to mess it up. Just watch the onions when you're browning them to be sure they don't burn. Heat the oil in the pot over medium heat. Add the onions to the hot pot and cook for about 10 minutes, stirring frequently. The onions should become soft but not yet browned. Add the garlic and broth and bring to a boil. Reduce heat and simmer for at least 15 minutes. You can keep the soup warm on the stove until ready to broil and serve, or allow it to cool and keep it in the refrigerator for 2-3 days. 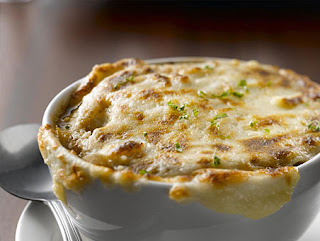 When ready to serve, heat the broiler and ladle the soup into individual oven-safe bowls. Top each bowl with a layer of bread, trimming slices if necessary to cover the entire surface. Heat under the broiler until the cheese is melted and beginning to brown. 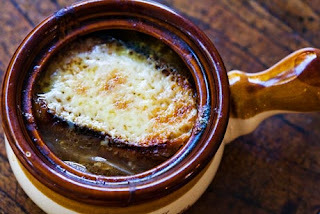 Soup is the epitome of comfort, a wonderful soul warming food filled with wholesome ingredients and fantastic flavors. 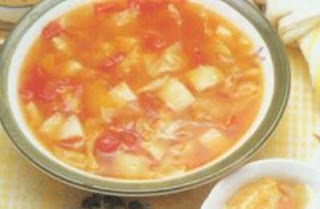 Homemade soup allows the cook complete mastery over what goes into each recipe, and the methods and techniques used to create delicious and nutritious dishes. Simply Soups presents easy to follow, step-by-step soup recipes in a format that takes the guesswork out of preparation, and allows the home chef to concentrate on creating perfect soup every time out. Soups are ideal as appetizers or starters, as a side dish, or as a one-pot meal. Most recipes presented here can be created with basic kitchen tools. A cutting board, sharp paring and chefs knives, vegetable peeler, wooden spoon, skimmer, measuring cups and spoons, a stand-up or immersion blender, ladle, saucepans, stockpot, and a kitchen timer are all that’s necessary to re-create restaurant quality soups in the comfort of your own kitchen. Most savory soups start with stock. As such, the soup maker should give considerable attention to stock, because this rich broth is so important to the taste of many great soups. Creating stock from scratch is a skill worth mastering, as so many recipes start with stock as the base to add and create rich flavor. Stock is the liquid from boiled meats, poultry, seafood, or vegetables, plus additional seasonings. The stock is filtered through one or more strainers, such as wire mesh or cheesecloth, the solid ingredients are discarded or set aside for later use. 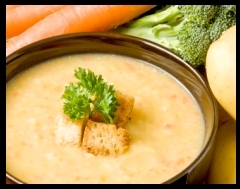 The resulting liquid is a rich, flavorful base ready to use in creating soups and stews. Fresh ingredients make the best dishes. To insure the highest quality results, invest in fresh meats, vegetables, herbs and spices. While the beauty of soup is the ability to use leftovers and items in the refrigerator and pantry that may otherwise spoil, when you are setting out to make a memorable dish, head to the supermarket and purchase fresh ingredients. Soup makes a wonderful addition to any meal, and once you make a pot or two, you'll discover it isn't really that hard to make. Final adjustments can be made before the soup hits the table. Some soups are finished with special sauces and garnishes, allowing each guest to create a dish that suits their particular taste. Soup can be savory or sweet, hot or cold, thick or thin. SimplySoups.com offers hundreds of taste tested soup recipes in 24 categories, from simple to gourmet, including the classics and many new and exciting soup creations. Combine all the ingredients in a large, heavy stockpot. Cover, cook, stirring occasionally, for 2 hours or until the vegetables are very tender, adding up to 2 cups more broth if necessary. Season with salt, 1/2 teaspoon at a time, tasting after each addition. Stir in flour until well blended with the onions and pan juices. Add water, wine, and beef broth; heat to boiling. Reduce heat to low. Cover soup, and simmer for 10 minutes. Cut four 1 inch thick slices of bread from the loaf. Toast the bread slices at 325 degrees F (165 degrees C) just until browned, about 10 minutes. Reserve the remaining bread to serve with the soup. Ladle soup into four 12 ounce, oven-safe bowls. Place 1 slice toasted bread on top of the soup in each bowl. Fold Swiss cheese slices, and fit onto toasted bread slices. Place soup bowls on a cookie sheet for easier handling. Melt butter with oil in large soup pot - add sliced onions and stir to coat ~ cover pot and cook over moderately low heat for 15 - 20 minutes - stirring occasionally until onions are tender and translucent. Uncover pot and raise heat to moderately high - stir in salt and sugar (sugar carmelizes and helps onions to brown) - cook about 30 minutes - stirring frequently until onions have turned an even deep golden brown. Lower heat to moderate - stir in flour and add a bit more butter if flour does not absorb into a paste with the onions. Cook slowly, stirring constantly for 12 minutes to brown flour lightly. Remove from heat - pour about 1 cup of warmed consomme into onion/flour mixture to blend flour and consomme - add rest of consomme, water, wine, bay leaf and sage - bring to a simmer. Simmer slowly for 30 - 40 minutes. If you are not serving right away, let cool, uncovered, then cover and refrigerate. 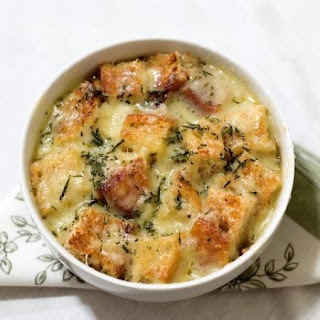 Reheat when ready to serve - place in ovenproof soup bowls - top with a slice of toasted french bread, shredded mozzarella cheese and parmesan cheese. Place under broiler to melt cheeses until bubbly. Melt the butter in a 4-quart pot over medium heat. Stir in the onions and season with 1 tsp. salt and a few grinds of pepper. Reduce the heat to low. Press a piece of foil onto the onions to cover them completely, cover the pot with a lid, and cook, stirring occasionally (you will have to lift the foil), until the onions are very soft but not falling apart, 40 to 50 minutes. Remove the lid and foil, raise the heat to medium high, and stir in the sugar. Cook, stirring often, until very deeply browned, 10 to 15 minutes. Meanwhile, to make the croûtes (baguette toasts), position a rack in the center of the oven and heat the oven to 350°F. Butter a rimmed baking sheet and arrange the baguette slices on the sheet in a single layer. Bake until the bread is crisp and lightly browned, turning once, 15 to 20 minutes. Set aside. 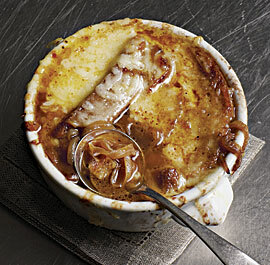 Add the broth and bay leaf to the caramelized onions and bring the soup to a boil over medium-high heat. Reduce the heat to medium low and simmer for 10 minutes to blend the flavors. Discard the bay leaf and season to taste with salt and pepper. To serve, position a rack 6 inches from the broiler and heat the broiler to high. Put 6 to 8 broilerproof soup bowls or crocks on a baking sheet. Put 2 or 3 croûtes in each bowl and ladle the hot soup on top. Sprinkle with the cheese and broil until the top is browned and bubbly, 2 to 5 minutes. Serve immediately. Melt butter in 4-quart pot over moderate heat. 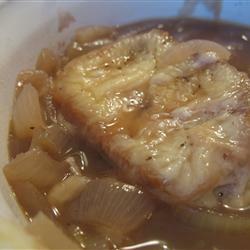 Add onions; saute until soft and lightly browned. Cover and cook over low heat for 20 minutes. Add consomme, water, Worcestershire sauce and pepper. Bring to a boil; reduce heat and simmer for 30 minutes. Stir in wine if desired. Place slice of toasted French bread in soup bowl. Pour hot soup over toast, then top with cheese. Place under preheated broiler for a few minutes until cheese is brown and bubbly.